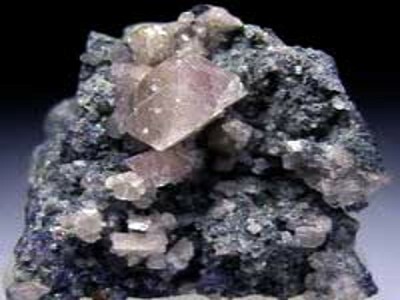 Lawsonite is a hydrous calcium aluminum sorosilicate mineral with formula CaAl2Si2O7(OH)2·H2O. It is a pale or grayish blue mineral in prismatic orthorhombic crystals consisting of hydrous calcium aluminum silicate. It is a metamorphic mineral typical of the blueschist facies. It also occurs as a secondary mineral in altered gabbro and diorite. Lawsonite is a rare mineral and is a hydrated variant of the feldspar Anorthite. It was first described in 1895 for occurrences in the Tiburon Peninsula, Marin County, California. It is named after Andrew Cowper Lawson (1861-1952), a professor of geology at the University of California at Berkeley. Color: Colorless, white, pale blue to grayish blue. Lawsonite crystallizes in the orthorhombic system in prismatic, often tabular crystals. Crystal twinning is common. It forms transparent to translucent colorless, white, and bluish to pinkish grey glassy to greasy crystals. 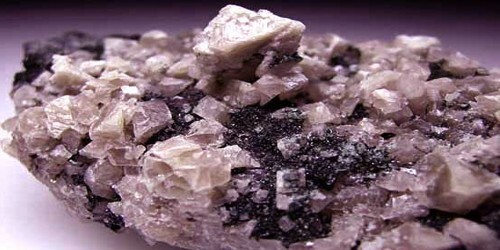 The mineral has a Mohs hardness of 8 and a specific gravity of 3.09. It has perfect cleavage in two directions and a brittle fracture. Lawsonite has crystal habits of orthorhombic prismatic, which are crystals shaped like slender prisms, or tubular figures, which are form dimensions that are thin in one direction, both with two perfect cleavages. Under the microscope, lawsonite can be seen as blue, yellow, or colorless under plane polarized light while the stage is rotated. Occurrence: Formed at high pressures and low temperatures, especially in low-grade regionally metamorphosed glaucophane schists; formed from plagioclase during saussuritization of gabbros and diabases; rarely in eclogites. This mainly occurs along continental margins (subduction zones) such as those found in: the Franciscan Formation in California at Reed Station, Tiburon Peninsula of Marin County, California; the Piedmont metamorphic rocks of Italy; and schists in New Zealand, New Caledonia, China, Japan and from various points in the circum-Pacific orogenic belt. Association: Pumpellyite, epidote, garnet, crossite, muscovite, jadeite, glaucophane, quartz, calcite.